Sixteen Tons Entertainment and Deep Silver are currently working on hot missions for fans of rescue strategy games – with Emergency 2013, a new installment to the Emergency series, is currently in the works. Emergency 2013 offers owners of Emergency 2012 a campaign with four new missions: A large volcano is about to erupt – all over Europe, magma currents must be diverted. The rescue workers need to deal with forest fires, eruptions, toxic gases, and outraged citizens in order to save everyone from disaster. 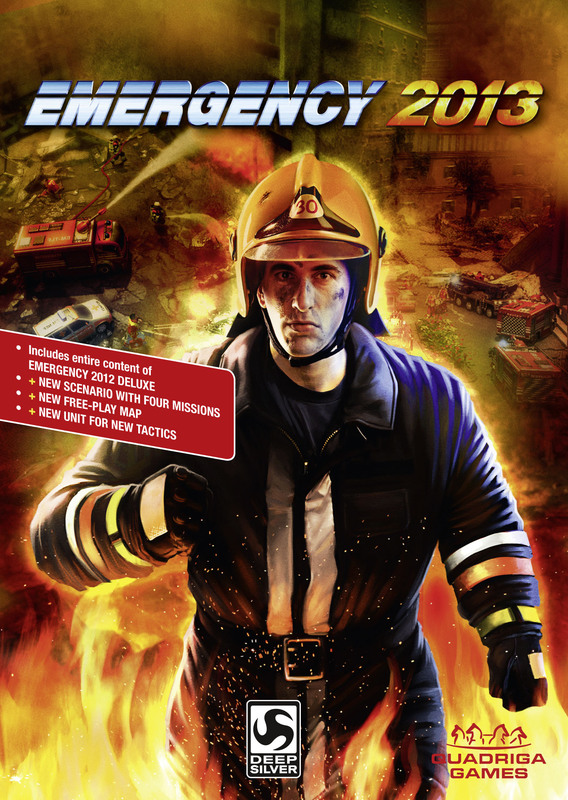 Emergency 2013 will be released as a downloadable campaign pack via digital distribution platforms (main game required), and as an edition complete with the new campaign and the contents of Emergency 2012 Deluxe. Deep Silver and Quadriga Games will release Emergency 2013 for Windows PC on November 9, 2012. For more information, visit http://e2012.deepsilver.com. Deep Silver develops and publishes interactive games for all platforms, seeking to deliver top-quality products that provide immersive game experiences driven by the desires of the gaming community. The company has published more than 200 games worldwide since 2003, including the critically-acclaimed, best-selling zombie action game, Dead Island™. Upcoming titles include the side-scrolling arcade brawler, Sacred™ Citadel, the isometric action RPG, Sacred 3, and the next game in the Dead Island franchise, Dead Island Riptide. Deep Silver, Inc. is a wholly-owned subsidiary of Koch Media, GmbH. For more information, please visit www.deepsilver.com or follow us on twitter at @deepsilver. EMERGENCY 5 is developed cooperatively by the development studios Sixteen Tons Entertainment and Quadriga Games. While Sixteen Tons Entertainment has been located in Tübingen, Germany, since 1993, the creative home of Quadriga Games is in the media city of Potsdam-Babelsberg near Berlin, where the company develops games for browsers, mobile platforms, consoles, and the PC. Sixteen Tons Entertainment and Quadriga Games are managed by industry veteran Ralph Stock, who has assembled a team of creative and highly qualified experts in the fields of game design, graphics, and programming at both studio locations. Studio head Ralph Stock has been involved in computer games since day one. He published his first commercially successful computer game, “Der Stein der Weisen” for Commodore 64, back in 1984, and helped ensure the success of cult games from such companies as Lucasfilm or SSI in Germany in the early 1990s. As a developer, Stock was responsible for world hits such as MAD TV or the EMERGENCY series. Ralph Stock manages the development studios of Sixteen Tons Entertainment, Quadriga Games, and Serious Games Solutions.